This is Part 1 of a series of articles on energy use in the Philippines, what we can all do to lessen energy use in our homes, and El Nido Resorts as a case study for how small changes mean big savings. As an Environmental Officer for El Nido Resorts, one of my main duties is conducting the Be GREEN (Guard, Respect, Educate El Nido) environmental practices training seminar for all new staff. The seminar includes modules on ecological solid waste management, water conservation, energy conservation, biodiversity conservation, and environmental legislation. Former Miniloc Island Resort EO Meanne and I first made the modules in 2007 and although their aesthetics have changed over time (thank you Rima and Kring! ), the contents have basically stayed the same since then. Since it’s now 2012, I figured it was about time we revisited the statistics and see where the Philippines stands. This is where it gets pretty interesting. Note: the two charts were generated from publicly available data provided by the Department of Energy. 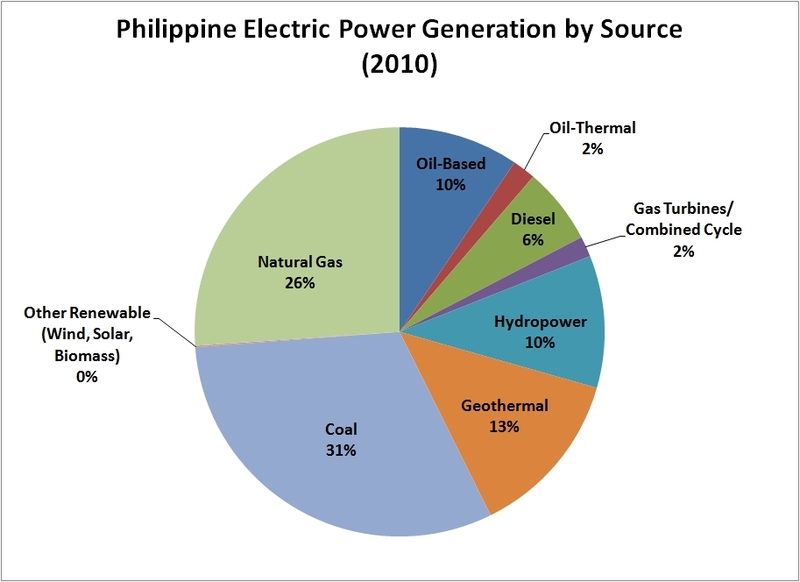 Figure 1 shows us where the Philippines gets its electricity. In 2010, 77% of our electricity came from fossil fuels, with coal and natural gas as our primary sources. To meet the demand in 2009, we imported 7.76 billion short tons of coal and burned 111 billion cubic feet of natural gas from the Malampaya Deepwater platform. Renewable energy doesn’t even make up one-fourth of our electricity mix. While we use geothermal and hydropower to some extent, wind, solar, and biomass combined supply only 0.13% of our electricity (the number in the chart was rounded down). This is a pity as the Philippines is a tropical country with strong sunlight for most of the year. 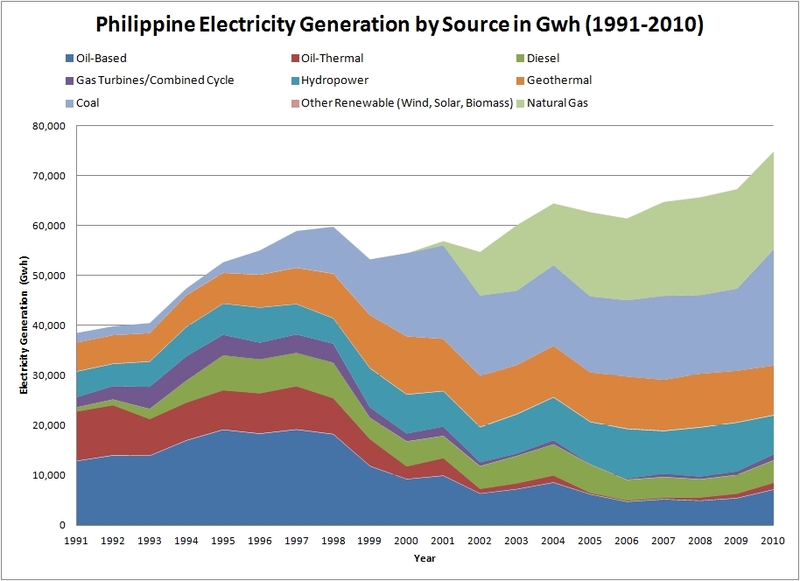 The Philippines has experienced steady growth in electricity generation over the years, mostly due to natural gas from Malampaya and imported coal (see Figure 2). Unfortunately, investment in renewable energy hasn’t increased in any significant manner over the years. Where does the electricity go? 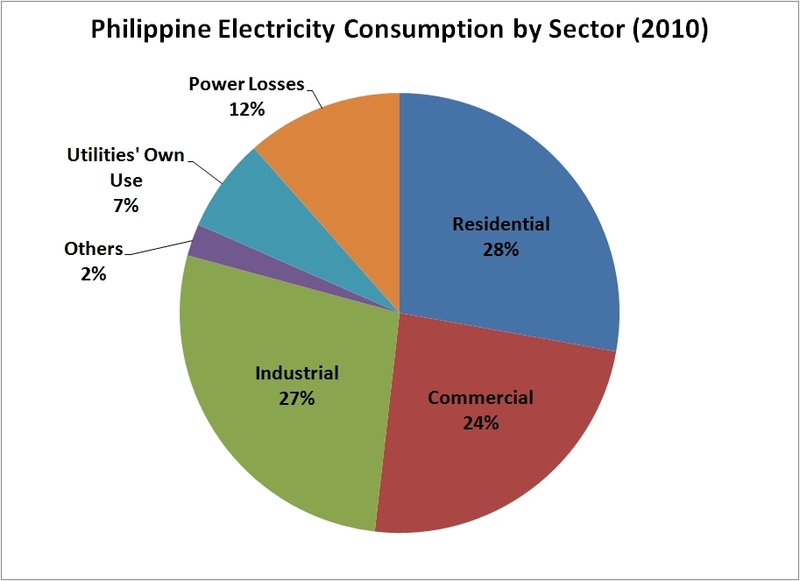 In 2010 (see Figure 3), all of our homes combined accounted for 28% of the Philippines’ electricity use, putting us above industrial use (27%). This is a very important figure to know, as this proves that when we work together, even the smallest things we do to lessen electricity use in our homes will have a huge impact. Electricity consumption has also risen over the years, driven by economic growth (see Figure 4). 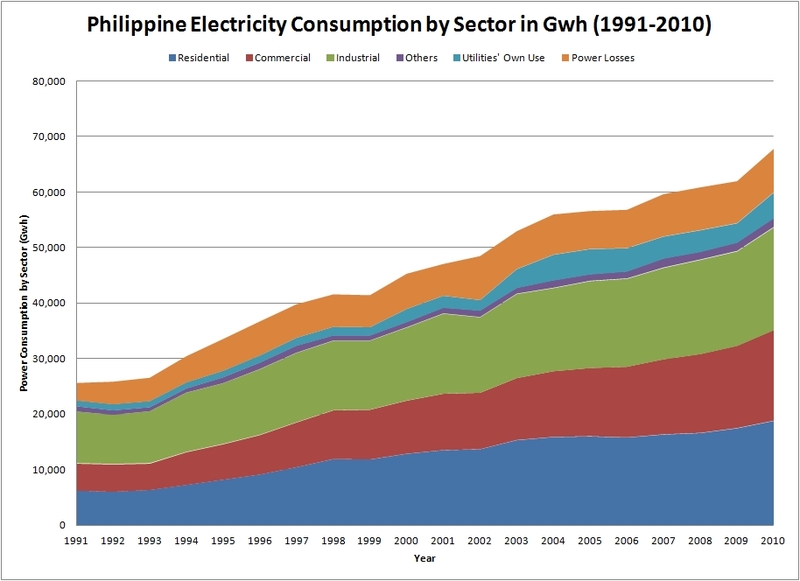 Filipinos now have the ability to buy increasing numbers of household appliances (such as TVs, refrigerators, and computers), resulting in increased electricity use in households. We have more shopping malls where we can buy the appliances. We’ve also experienced growth in our industries. With these facts in mind, it’s easy to see how the twin engines of increasing energy demand and our reliance on fossil fuels are driving the Philippines towards an energy crisis, if we aren’t there already. Solving the energy crisis is a two-step process: 1) shifting to renewable energy and 2) decreasing our energy demand.First, why does the Philippines need to shift to renewable energy and fast? There are several good reasons for this. Economics. In 2009, we imported 288 thousand barrels of oil per day (that’s 105.12 million barrels in a year!) for use in both transportation and electricity generation. We also imported 7.76 billion short tons of coal for electricity. The prices of these goods are dependent on the international market and are not something we can control. Any disruption in the countries that supply us with these products – political unrest, natural disasters, war, etc. – may result in higher prices. These products will also run out eventually. The Malampaya field is our largest source of natural gas, but “if no further activities [development] are undertaken until 2014”, its output will start dropping by 2015 and will run out by 2024. Health. Fossil fuels must be burned to harness their energy. Burning fossil fuels releases not just carbon dioxide, but also fine particles, sulfur dioxide, nitrogen oxide, polycyclic aromatic hydrocarbons (PAHs), and benzene – products linked to lower birth weight and infant mortality, decreased lung function, childhood asthma, developmental disorders, and cancer. In 2004, 4.9% of all deaths in the Philippines, including 12% of deaths in Metro Manila. were attributed to air pollution. By 2005, air pollution resulted in Php 962 million per year in medical expenses and lost income. And oh, sulfur dioxide and nitrogen oxide combine with water vapor in the air to form sulfuric acid and nitric acid, which fall back to earth as acid rain. Second, what can we do to decrease our energy demand? It really isn’t all that hard. You just need some planning, some switching, and the will to do it. Part 2: What can we do to use less electricity in our homes?